I’ve read about the harm plastic bags do to our environment, but I, like many others, did not really pay much attention to the seriousness of the problem until yesterday, when I spent the afternoon with Dawson’s environmentalists, at the city dump. 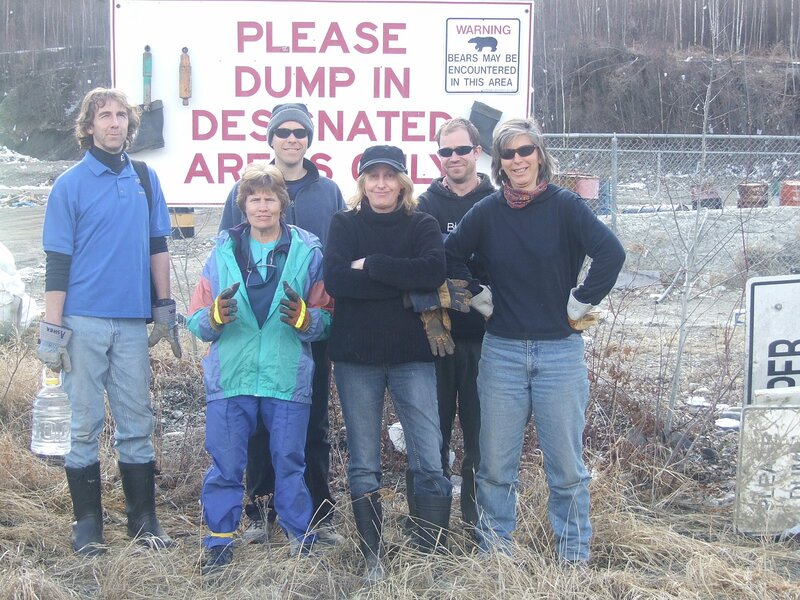 The landfill is enclosed by an electric fence, designed specifically to keep the bears out of the garbage, but due to the tremendous amount of plastic bags deposited on fence over the winter months, it had ceased to function — shorted out by the polyethylene bags. Beyond the fence, the oh-so-convenient plastic bags decorated trees, choked small ponds and lay tangled in the grass creating a haunting canvass of what the future might hold. It takes over a thousand years for plastic bags to break up, and in doing so numerous toxins will leach into the ground and ultimately into the food chain. Did you know, that over 4.5 trillion plastics bags are produced each year of which only one-percent are recycled? Think about those numbers and then say no to plastic and take a reusable bag with you the next time you go shopping. Wherever I go and wherever I’ve been, I never feel that I’ve explored properly until I’ve walked through the cemeteries and read the headstones. Dawson City is rich in cemeteries and there is one just down the road from the Berton House. 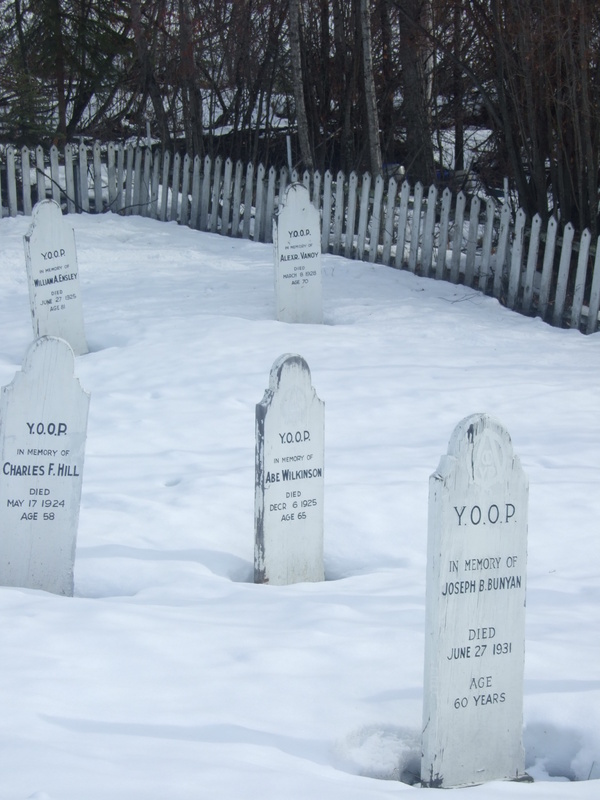 It’s reserved only for members of the YOOP, (Yukon Order Of Pioneers) who lived and died by their motto:Do unto to others as you would be done by. In his book, The Klondike , Pierre Berton writes: Each member pledged himself to help every other member should the need arise and always to spread the news of a fresh gold discovery. For many years, this motto imposed law and order on a lawless land. Those who broke it, ended up banished or swinging from the end of a rope. This Friday, I am going grave- yarding with a friend — can’t wait for that. At last, after almost three weeks of writing all day and every day I have sent in the edit on my latest book. Pushing send was the most euphoric feeling in the world. With luck, there will only be one more edit — usually there are a minimum of two and sometimes three or even four. That was number two. I celebrated by going out on the weekend to the most local of local bars in Dawson — The Pit, with a group of artists and playwrights who hail from not only Dawson, but all over Canada. As you can see by the photo, The Pit is full of artifacts, and interesting characters. 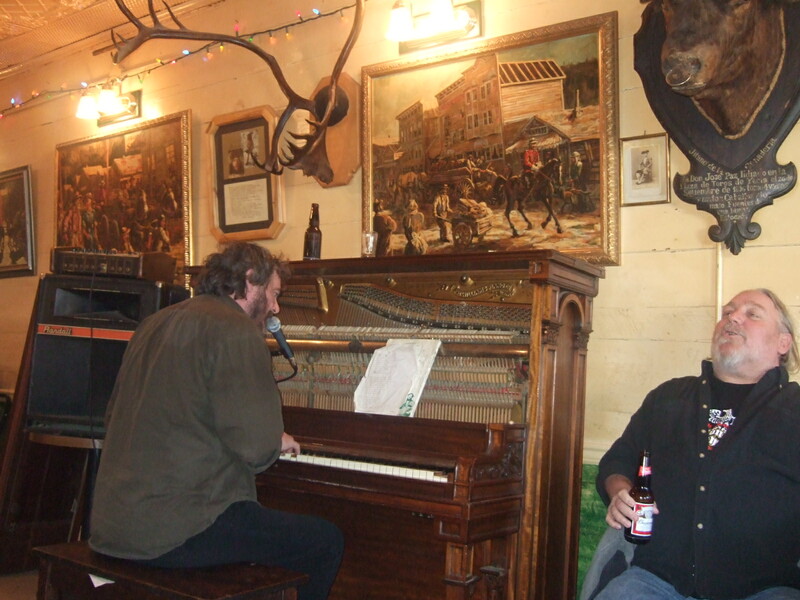 That’s Barnacle on the piano, and he keeps the place hopping. Because I have spent the whole week working on my novel, I haven’t visited my blog at all. A looming deadline dictates my schedule right now. The big events this week, besides the fact that the snow is disappearing are: The Eldorado Hotel (Princess and Third) caught fire, and although the firemen were able to contain the blaze, the combination of fire, smoke and water has destroyed the building. Apparently, it was the last year-round hotel in Dawson, but don’t quote me on that. Also, the ice bridge closed, but that doesn’t seem to stop the brave (or foolish) locals from using it. I, on the other hand, won’t even walk over it anymore… The whole town is betting on when the Yukon will break-up. I guessed May 9th, 5pm and I can’t remember the exact seconds. Apparently there is a big cash prize for the winner. Below is a photo of the Break-up-alarm. 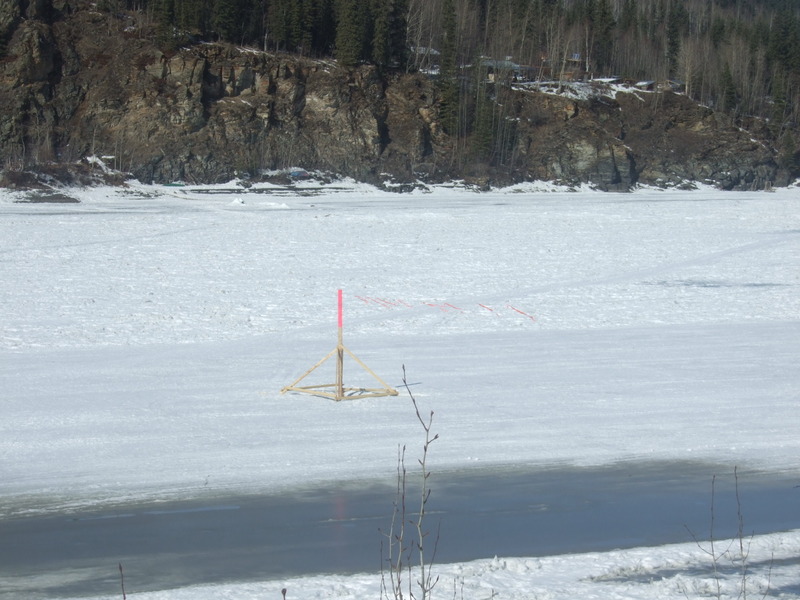 It is a large tripod shaped object that sits on the river and is attached by wire to a clock on shore. When the ice breaks, the clock shifts and the wire stops the clock at the exact time of break-up. The fire station is notified and a siren goes off. All very high-tech. This is how the winner is decided. 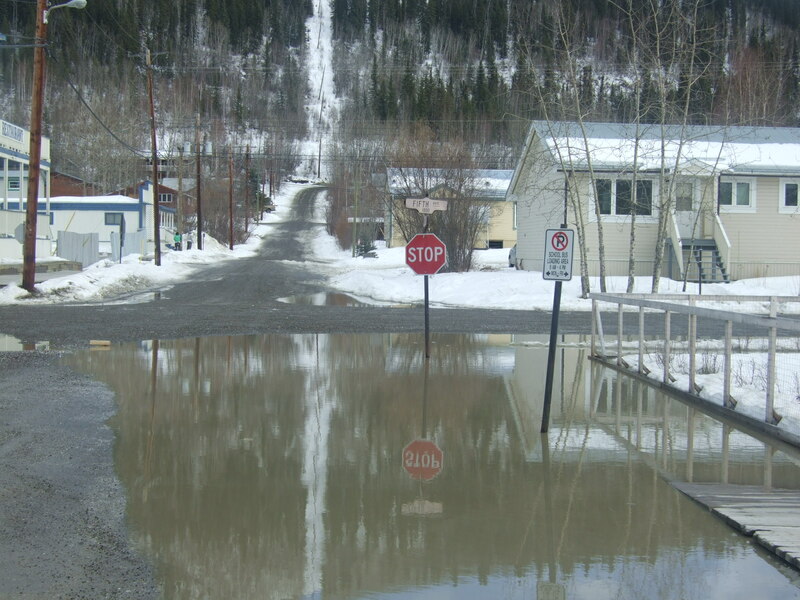 The big melt is on in Dawson. In the week that I have been here, at least half of the snow has disappeared. Little remains on the hills that surround the town and there are patches of water visible on the Yukon. The whole town is betting on the exact date of the break-up — there is a large cash pot for the winner. I have no idea when that will happen — I’m already freaked out about being on an ice bridge when I can see water…but I’m going to place my bet today. I don’t go for walks anymore, I go for wades. The lower half of Dawson is under water. The drainage pipes are still frozen from winter, so the run-off has nowhere to go. I love walking because the constant dripping reminds me of rain and therefore of spring. Normally, nothing would drag me out of bed at 6:15 in the morning, particularly when it’s still dark and the thermometer reads-3, and the reason for getting up is to attend a church service. Today, I made an exception. 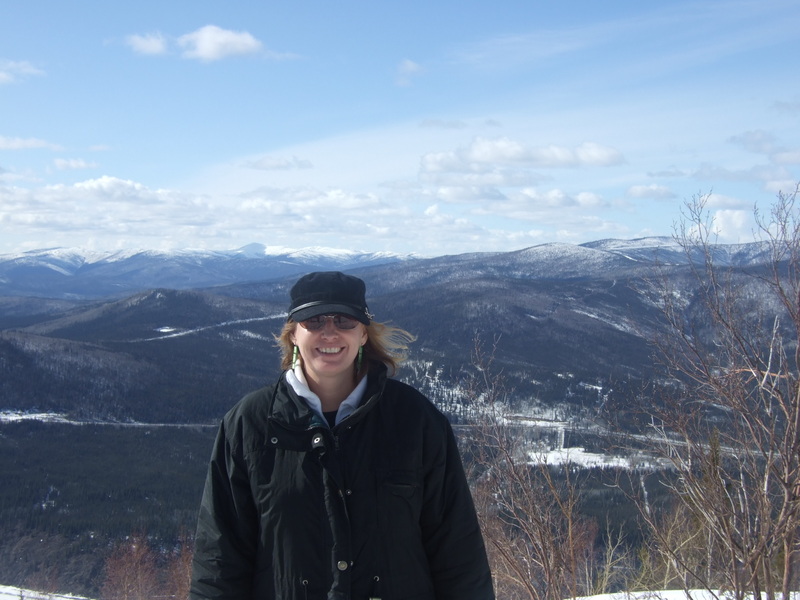 I was intrigued when, Kathy, my wonderful hostess/guide/friend extended an invite to a 7:30am interdenominational Easter service, to be held high on the cliffs above Dawson City. I have to admit, I hesitated for a minute, but I was in, as soon as the words, “followed by a big breakfast with eggs benny,” were out of her mouth. (JR, if you are reading this, always make sure to include a feast when converting). It was an awesome service — the best I’ve ever been to. There were about thirty of us, and in the distance we could hear a lone raven calling out. The attending Anglican minister kept the service short, and relevant. 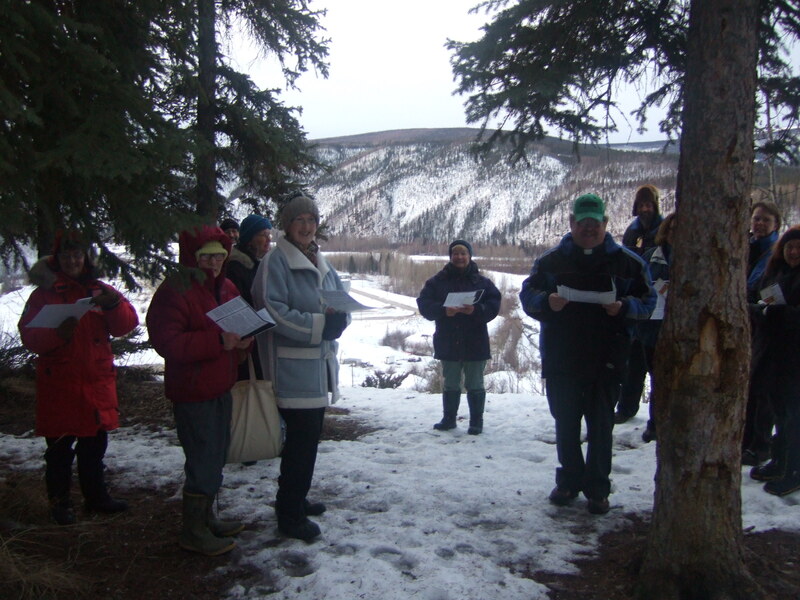 There was a certain pagan appeal to the whole ceremony as we stood heads bowed, the forest in front of us, and the frozen Yukon River our backdrop. The bluffs were once a tent city to over 40,000 miners, and as we drove up the road, we passed at least three cemeteries filled with the graves of mostly young men who had come to Dawson to find gold and never left. I couldn’t help wondering how many of those fortune hunters had stood on those same bluffs, so many years ago and said a little prayer for survival. By the number of headstones peeking up out of the snow, I think it’s fair to say, that not all of their prayers were heard.